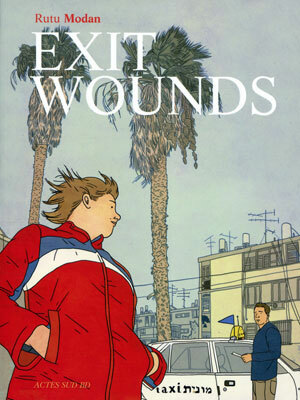 I was looking for Jewish graphic novels, and came across the work of Israeli graphic novelist Rutu Modan, who is certainly one of the best graphic storytellers of basically realistic stories. Modan, born in Tel Aviv, in 1966, has three major books for adults published by the amazing Drawn and Quarterly. This one, The Property and a book of shorter pieces called Jamilti and Other Stories. as well as two on-line projects in the New York Times: a visual blog called Mixed Emotions and a serial that ran in the Times magazine called The Murder of the Terminal Patient. Exit Woulds is the story of a cab driver, Koby and the young soldier Numi who tells him some news about a bus bombing in Hadera. The news prompts Koby into action and the two of them investigate the bombing and the identity of one particular victim. Their awkward friendship takes them into the world of the witnesses of the bombing who all have different motives for telling them or not telling what they need to know. And beyond into both of their lives, where both of them are on the outside of their families. They become closer than friends, but only edge into the realm of a more romantic relationship which neither of them can quite allow themselves to fully enter. It is good to read stories from war torn places that take the context, and make me feel (in my ignorance of what it is really like) that life goes on. That people live and die, have family and relationship troubles, that human scale stories stream through the life of the place. As Numi and Koby come to terms iwth what they discover and what how they see each other, Modan is brave enough leaving the end unresolved with Koby stuck up a tree, and Numi encouraging him to jump. In the penultimate frame she holds out her arms. In the final frame, we see he has jumped.